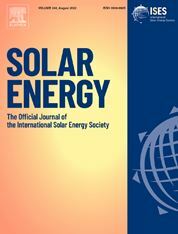 Solar Energy, the official journal of the International Solar Energy Society®, is devoted exclusively to the science and technology of solar energy applications. The Society was founded in 1954 and is now incorporated as a non-profit educational and scientific institution. With participation encompassing 100 countries, ISES® serves as a centre for information on research and development in solar energy utilisation. Through its publications and its sponsorship of technical conferences, the Society provides a world forum for the active consideration of solar energy. Solar Energy welcomes manuscripts presenting information not previously published in journals on any aspect of solar energy research, development, application, measurement or policy. The term "solar energy" in this context includes the indirect uses such as wind energy and biomass. Because of the international character of Solar Energy, articles that deal solely with the solar radiation or wind data base of a specific country are not normally considered suitable for Solar Energy. Submitted manuscripts may take the form of reports of original studies or reviews of significant prior work in a given area. All manuscripts are subject to reviews to assure accuracy, clarity, and long-term value. Manuscripts of general interest not being suitable for Solar Energy should be submitted to Refocus, which publishes magazine-style feature articles concerning all aspects of renewable energy. Please e-mail David Hopwood, Editor for further details (d.hopwood@elsevier.co.uk) and visit http://www.re-focus.net.